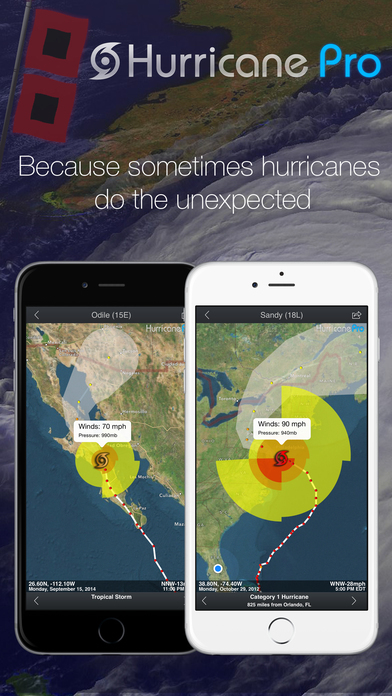 Hurricane Pro – Your Hurricane Tracker! As the first hurricane tracker to be released back in 2008, Hurricane Pro has been keeping people like you safe for over 8 years. Updated often with interactive features and detail, no other hurricane tracking app comes close to the information provided inside Hurricane Pro! Reviewed by CNN as having the best features of the Hurricane Tracker apps available for iPhone GOOGLE: “cnn top hurricane app” to read the article! Video Updates Extremely detailed video updates provided by an exclusive partnership with the experts at HurricaneTrack.com. HurricaneTrack.com gets in front of the storm and broadcasts back video and information from the front lines. They also provide our weekly video outlook. Twitter Feed All the latest news and updates through Twitter integration. Link to the FSU model runs. Preparedness Tips, Storm FAQs and MUCH More! La perspectiva de actividad ciclonica, advertencias, y una explicacion del pronostico praparada para usted, cortesia de la oficina meteorologica de San Juan Puerto Rico. learning more about historical hurricanes like Camille, Hugo, Andrew and Katrina, just to name a few. Love Hurricane Pro? Get Hurricane HD for your iPad today! All official hurricane data originates from the NHC. Hurricane reports the data as it becomes available, however is not guaranteed. ALWAYS execute personal responsibility – watch local media outlets when threatened by a storm! Internet Connection required to receive new plots and view new satellite pages and text bulletins. We cannot guarantee that our product is the right one for you, as no single application is perfect for everyone. Our goal however, is to create the best, most informative hurricane tracking application possible.